Saw IT this weekend and was so happy to finally have a Stephen King adaptation that rose to the heights of the book. It was classic 80’s King, which also feels current due to the recent 80’s revival with shows like Stranger Things and the Goldbergs. 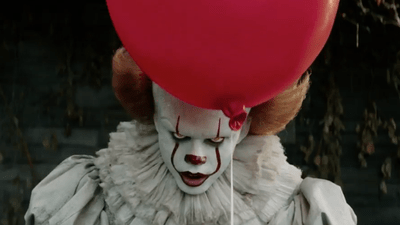 My favorite aspect of the film was the fact that Pennywise actually doesn’t have a ton of screen time. After a relatively horrifying opening scene the terror comes more from anticipation than out-and-out horror. There is a fine line between horror and terror, especially when you’re talking about a Gothic film. Terror is the feeling of dread and anticipation that precedes the horrifying experience. While horror is the feeling of disgust that comes after something terrifying is experienced. So, horror is more related to being creeped out, or scared, while terror is more related to being anxious or fearful. In this regard maybe we should call IT a terror film more than a horror, and I mean this as a compliment. Here’s hoping the inevitable sequel continues the trend. I finally got around to reading the short story “The Story of Your Life” by Ted Chiang. I’d been meaning to ever since I heard that the movie Arrival was based off of it. I’ve written before how much I liked Arrival and the story that inspired it was just as interesting. At 45 pages it pushes the boundary between short story and novella, but the pace is quick and the writing crisp. I was able to easily read it in a single sitting, which to me is the definition of a short story. If I have to break it into pieces it ceases to be the same kind of narrative experience, so I was glad of the length. Plot-wise the film version stayed very true to the book, so I won’t give any spoilers except to say that the concept of language and perception of time play a large role. This really got me thinking. How much of what we think of as reality is based on how we express our experience of it? If by some quirk of fate the Earth had two suns and therefore no night, how much would our inner worlds change? The idea of light and dark is central to how we think, how we mythologize and even how we act. If that was taken from us, who would we be? Or what if our intelligence evolved more along the line of bees with a hive mind- intelligent, but only within the group. How much different would the stories we tell ourselves be? Yet, in both of the hypotheticals the reality we would experience, write about and think about, would be no less true than the one in which we currently reside. Sort of makes you question the objective nature of things a bit. How much of what is “us” and our “reality” is simply a matter of perception filters? And if we accept that how we view and interact with our natural environment is largely responsible for how we view existence, should our behavior change? Do we now question objective truth? Or does it simply narrow the scope of where objective truth can lie? This narrowing seems to me to be a good thing as any simplification of reality makes that reality more graspable. This is why I love science fiction when it is done well. It is philosophy buried in narrative so that our brains can ease onto roads of inquiry that we may otherwise avoid as too perilous or frightening. I’ve always enjoyed Lincoln Child’s collaborations with Douglas Preston, but this is the first solo work of his I have read. The Adirondacks, and “enigmologist” and werewolves! Quick fun read. No heavy lifting required. This book was tailor-made for me. It is like the author found every element that I found fascinating and rolled them into one short novel. My only small complaint is the ending. Wrapped up a little too neatly for my taste, but I am quibbling. This was an excellent book. Genre: Horror, but tastefully done for the most part. There are a couple grisly scenes but they are necessary. More than anything McMahon has mastered the art of creepy. Much of the story was the reader catching glimpses of something terrifying, mere shadows in the dark. Yet all the classic pieces are here, a lonely farmhouse, supernatural legends about the woods out back, mysterious deaths and vanishings; they all play their parts. Setting: Vermont. Winter. 1908 and present time. She does an interesting thing with the timeline of the novel. We are actually given two stories, one happening now and one that happened over 100 years ago. They fit together well with each influencing how you read the other. Characters: There are quite a few. It is basically about two families living in the same house at different times. And while this definitely isn’t a middle grade novel, the children do play major roles in both family’s story. The point of view shifts each chapter between the different characters with the reader always knowing more than the character. I didn’t really notice it as I was reading, but now that I think about it, it is a very female centered book. There is only one male character of any note. Plot: For over 200 years the town of West Hall has been one of mystery. In 1908, Sarah Shea was found dead behind her house just months after the tragic death of her young daughter, Gertie. In present day, nineteen-year-old Ruthie lives in the same farmhouse with her mother, Alice, and her six-year-old sister, Fawn. They live completely off the grid, existing more like a family in the Alaskan wilderness, than rural Vermont. Ruthie wakes up one morning to find that Alice has vanished. As she searches for reasons for her mother’s disappearance she finds a copy of Sara Shea’s diary hidden beneath the floorboards of her mother’s bedroom. As she dives deeper into the mystery of Sara’s death, she begins to peel back the layers of mystery surrounding her town, home and family. I recently finished another book, Andrew Pyper’s The Only Child, which attempted to rewrite the classic Gothic novel for the 21st century. In a lot of ways McMahon is doing something similar for the traditional ghost story. If you enjoy being creeped out, but not grossed out by your horror than The Winter People is definitely worth your time. At only about 300 pages, and a quickly moving plot, it is the perfect vacation time read. What do you get when you mix 1 part Jame Rollins thriller, 2 parts Elizabeth Kostova’s The Historian and then stir vigorously with a Dean Koontz swizzle-stick? You get Andrew Pyper’s latest, The Only Child, a modern spin on the Gothic novel. Gothic fiction has been with us since the early 1800’s. Most people think of such classics as Dracula, The Scarlet Letter or Frankenstein’s Monster when they think of the golden age of the genre. Pyper both tries to explain the genre as well as fit into it but in a modern context. Pyper hooked me as an author a couple years ago when I found his book, The Demonologist. That book literally kept me up at night. And while this latest release doesn’t quite reach the same terrifying levels of that previous novel, there is plenty here to love. As a young child, Lily Dominick, our main heroine, witnessed her mother’s murder, a suposed bear attack, in a wilderness cabin, but Lily herself was saved by a passing truck driver. However, this is just the official story. Lily has another, more fantastical memory. When she dreams she remembers her mother being mutilated by some kind of actual monster, and that she was saved from by a mysterious Pegasus-type creature. Weird, right? Now grown up, Lily Dominick is a criminal phychiatrist and she meets a unique, nameless, patient who is in the custody of the state after committing a pretty horrific crime. However, just as he reveals he only did the crime to meet her, he escapes from the psych ward leaving a bloody trail behind him. He then leads her on a journey of horror and self discovery across old world Europe. Without giving too much away, the patient is much more than he at first seems and through him Pyper attempts to explain the initial inspiration for the birth of gothic fiction. Three classic authors, Stoker, Shelley and Stevenson actually get cameos in the story. Even though the atmospheric romps through eastern Europe are almost a cliche of the genre at this point, I still enjoy the ride. In fact, ride is a good way to describe this novel. I’ve seen some criticism that points out that this book is a fast read, not the slowly developing, atmospheric, ballad that many traditional gothic novels are. And the critics are right, but I think they are missing the point. Pyper did not set out to write a 19th century gothic tale, he was trying to reinvent the genre for modern audiences, and in that I think he succedded quite well. Sometimes people critique the book they wanted the author to write, not the one in their hands. There is one flaw though, the length. It is just too short. I would have enjoyed a slower role out of some of the subplots and a little more time getting to know the protagonist before throwing her into peril. But I am nitpicking, any novel that can force me to finish it in three days is a great story as far as I’m concerned. I’ll put the bottom line up front for this review: Eaters of The Dead, by Michael Crichton, blends history, fantasy and science in a way that makes the read both enjoyable and educational. The novel tells the story of the real life adventure of a 10th-century Muslim who travels with a group of Vikings. The first portion of the novel is a factual retelling of Ahmad ibn Fadlan’s personal account of his journey north and his experiences with, and observations of, the Northmen. The second portion of the novel is a slightly reworked version of what is probably the most important epic poem outside of Homer- Beowulf. Like most people familiar with Crichton’s work I have read the greatest hits list of titles: Jurassic Park, The Lost World, The Andromeda Strain. In fact I have even read some of his lesser works: Timeline and Sphere. Yet, while I had a copy of Eaters of the Dead sitting on a shelf for the past ten years I have just never gotten around to picking it up. If I had known (or remembered) that it was inspired by Beowulf, I would have read it a long time ago, and it was only by accident that I picked it up last week. I had been doing a little last minute preparation for a brief lecture on The Hobbit to be given at the start of the school year. One of the aspects of Tolkien that has always aroused my interest is how he incorporates established mythologies into his newly created worlds. Shadows of Beowulf, an epic that as a scholar Tolkien spent quite a bit of time with, can be seen throughout Middle Earth. In The Hobbit, the dragon Smaug is loosely based on the dragon scene towards the end of the poem. As I spent a little time coming up with some cursory comments on Beowulf I stumbled across an anecdote about Crichton. I mentioned this in my previous post, but to recap; Crichton wrote Eaters of the Dead as part of an argument about the merits of the Beowulf story line for modern readers. This reader thinks he made his point. This novel is able to combine history and a reinvented Norse mythology in a way that is eminently readable. Interspersed throughout the book are detailed footnotes, which both give the illusion of an actual historical text, and also provide a good deal of background on Viking and Muslim culture in the tenth century. While I knew that once the first three chapters were completed the rest of the book was pure fiction, Crichton does such a good job at keeping the narrative in synch that I could allow myself a willing suspension of disbelief. One of the best attributes of this novel, in this reviewer’s opinion, is it’s brevity. Seventy-five percent of the text deals with a plotline that most high school seniors are pretty familiar with; so keeping the reader engaged in a retelling of a well-worn tale is quite an achievement indeed. Aside from keeping his story relatively short (by his standards) Crichton keeps the reader’s interest in large part by investing his main character and narrator of much of the tale, Ahmad ibn Fadlan, with a real voice. Seeing Viking behaviors and traditions through his eyes is an interesting twist. Much of the Viking lore has that familiar feel that comes from a steady diet of Saturday morning cartoons, comic books and action movies that plagues even the most studious reader. When Fadlan is shocked by one of the various actions of a real and historical people we as readers find ourselves a little shocked right along with him. While Michael Crichton may never be able to shake the reputation as the father of Jurassic Park, the short novel, Eaters of the Dead, shows that this writer of blockbuster sci-fi also had a more academic side. I for one am glad to finally find this out. Author Chuck Palahniuk is always an interesting read. Over the years I have read a handful of his works such as (of course) Fight Club as well as Choke and Survivor. Diary came out in 2003 and has similarities to his other works, but does stand out as one of the more revelatory novels in the Palahnuik cannon. The book is written, obviously enough, as a diary. Misty Wilmot, a once-aspiring artist is now working as a waitress in a seaside hotel on Waytansea Island, which stands in for a Martha’s Vineyard tragically gone wrong. Her husband is in a coma after an apparent suicide attempt. The book thus opens as a “coma diary” that she is writing to her husband as she wonders if he will ever come out of it. As the book unfolds Misty, and her latent artistic talent, become pawns in a twisted and slightly supernatural conspiracy that threatens not only her husband’s life but hers and many others. Diary is an odd combination, even for Palahniuk. It is part Choke, part Stephen King’s Misery, mixed with a little bit of Shirley Jackson’s The Lottery. The novel is just hard to classify. On the one hand it fits in the modern horror genre, though the horror is more psychological in nature and like all of Palahniuk’s books there is plenty of dark humor. After reading quite a few of these, I am used to the constant odd educational trivia diversions he takes both to perversely advance the plot as well as satirically poke fun at his own characters. (The first five pages alone have over 15 different scientific words for “fat” and “wrinkle” as Misty describes in detail exactly what her husband looks like after 100 days in a coma.) But while a novel like Choke seemed to rely heavily on this narrative device to tell his story, in Diary something more significant is going on. This novel may actually be better classified as a work of neo-meta-fiction. Certainly the fictional blind-leads and dead-end plot contrivances give the reader a solid mental workout. There is no subtlety in Palahniuk’s writing here. His words seem to dig into the reader, more often than not borrowing their way right under your skin. In telling the story of a once-ambitious artist and her struggle with the very concept of art, whether suffering is a prerequisite, whether you can ever create something that matters, one can almost hear the author himself grasping at what it all means. In the end what Palahnuik seems to say is that all we ever create is what we already are and therefore the struggle is meaningless. Diary appropriately references Plato’s Cave. It is here where all we see are our own shadows. We never see others for what they actually are; instead we only see aspects of ourselves reflected in others. We see what we want to see, which is of course only ourselves, for it is all a self portrait, a diary. 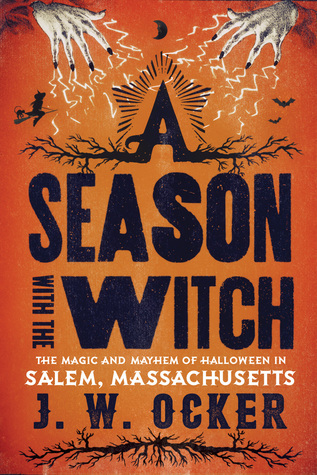 A Season with the Witch: The Magic and Mayhem of Halloween in Salem, Massachusetts by J.W. Ocker was a book I was really looking forward to reading for a variety of reasons; not least of which is the fact that I have been following his blog, OTIS,for a couple of years. Ocker is one of those rare authors who is really good at the weekly grind of running an interesting blog and is also a legitimately good author. His last book did win an Edgar after all. The charm of Ocker’s blog is that it is part travelogue, part horror fan confessional, and that ethos carries over to his latest book as well. Because I follow him online I was able to see a behind the scenes version of A Season with the Witch as it was being written and I even interacted a bit with the author during the process. (Well, as much as social media counts as actual interaction. Allow me my tangential connection). Ocker moved his family to downtown Salem for a month to witness firsthand October in Salem, visiting all of its historical sites and attractions. He also interviewed a lot of the people involved in making Salem’s Haunted Happenings, well, happen. From its political and civic leaders to its entrepreneurs and visitors. He even talks to some honest-to-god witches in the process. This was a quick and fun read made all the more enjoyable for me because I have been to Salem a few times myself. Many of the locations and events he describes are familiar to me and it is interesting seeing another person’s take on things. I particularly like the chapter on Hawthorne and not just because I have been to the House of Seven Gables. The universe aligned things just right and I was in the middle of that chapter right as I was teaching my students Hawthorne’s The Birthmark. Made for an interesting side lecture in one class. But by far the most interesting parts of the book are the interviews. There are so many competing views about how Salem does October. Some love the exposure it gives their city. Some think it is rank commercialism, capitalizing on the city’s shameful past. And others just seem to want to put their heads down and soldier through the month until they can have their city back. And due in no small part to Ocker’s treatment of his interviewees, I can sort of sympathize with all of them. That is what makes this book a great read. If 2016 has taught me anything it is that the celebrities I have grown up with are getting up there in years, and with my all-time favorite author turning 70, my mind has wandered to the day when I will have no more new Stephen King books waiting on my shelf. Then I found out that the King legacy is in good hands. The Fireman, by Joe Hill, aka Stephen King’s son, is one of the best page turners I read in 2016. It is a novel about a worldwide pandemic of spontaneous combustion that threatens to reduce civilization to ashes and a band of improbable heroes who battle to save it, led by one powerful and enigmatic man known as the Fireman. One of the things that I have always loved about King’s works is the sense of place. Having grown up in New England I have always had the sense that geography was just as much a character as Pennywise, or The Man in Black. Luckily, King’s son, Joe Hill brings that same emphasis on place to his work. I don’t want to downplay Hill’s gifts as an author by simply comparing him to his father either. Because this book is very different from the elder King’s work. I found the characters to be a bit stronger, while the emphasis on the macabre was a bit lighter. All-in-all a great combination. I was too young to have seen Close Encounters in theaters, but once HBO put it into regular rotation in the early 80’s it quickly became a personal favorite. I’ve always had a thing for science fiction, especially when human and alien interaction is involved in a serious and realistic way. Close Encounters did this perfectly for its time and in fact still holds up pretty well in our CGI world. There has only been one other film to leave a lasting impression on me in the same way. Jodie Foster’s Contact. What both films have is an appropriate sense of awe and otherness. They take their time letting silences linger so you actually have time to think about the films as you’re watching them. Some people may find this tiresome, but to me it is film making at its best. And this past weekend I saw a film that just may join this pair to create a triumvirate: Arrival. It has been called “one of the best movies of the year, a moving, gripping film with startling twists and imagery. It deserves serious treatment as a work of art.” and I couldn’t agree more. I can not really explain the plot without spoiling the movie but I can say that it’s core idea is that language defines us, and the reality we experience. We all may be living on the same planet, but how our language is constructed, the actual grammar, matters in terms of how we experience the world around us. Suffice to say, communicating with an alien race brings these differences to the fore. No shock that as an English teacher I tend to read a lot. Though the older I get, the less of it is in book form. In fact I’d say better than 70% of my reading happens online these days. But I still like to read myself to sleep most nights with a good old fashioned codex and my wife found this book in hardcover at our local library for just a buck. Let the late night, nightmare inducing readings begin. Currently reading Artifact by Gregory Benford. It was written in 1985. This quote could have been written yesterday. Loved his first, The Demonologist. This is a worthy, if slightly less terrifying successor.